Sir Alonne came from an eastern land and chose to serve a little-known and unestablished lord. He became the lord’s most trusted knight and helped him become the Old Iron King. Sir Alonne was a master of the quick-draw and in obeisance to his new lord, Sir Alonne trained the Old Iron King’s men in the sword. After establishing himself, the Old Iron King descended into absolute depravity. Once, the Old King could have unraveled the greater mysteries, with the aid of his great soul, but he was led astray by his enormous fortune, becoming nothing more than a vulgar hedonist. At the end of the very peak of his sire’s rule, Sir Alonne disappeared. He was said to have deserted his liege after bearing witness to his descent into depravity, setting out again in search of lands yet unknown. 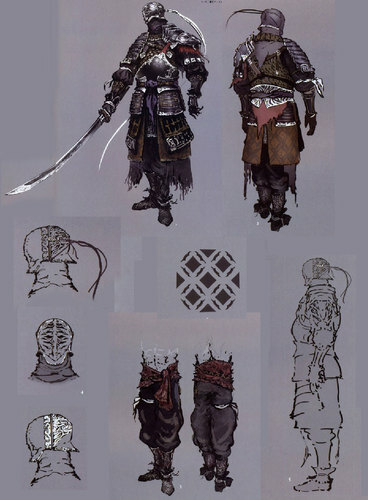 But the loyalty of the Alonne Knight was the stuff of legends. 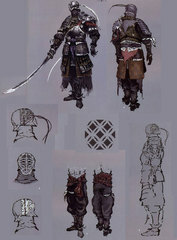 These men, trained by Sir Alonne were renowned for their loyalty, and yet their leader deserted his liege. These two facts do not seem to fit. The Player encounters Sir Alonne in the Memory of the Old Iron King. We know that acts carried out in Memories do affect the history of reality, as seen in the battle against the Giant Lord. If this is the case, then when the Player kills Sir Alonne, they bring an end to his story, and the rumors we read of were simply started as an explanation for this seemingly random event. After his departure, whether by the Player’s hands or because he truly did set out again, the Old Iron King bequeathed Sir Alonne’s name to his iron warriors. This seems very much like a gesture to a deceased friend, who had helped him become what he was, than the honoring of a traitor who had abandoned the Old Iron King right when he needed him again. 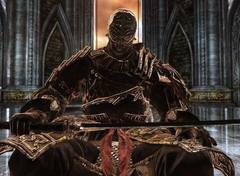 Sir Alonne was a warrior who valued honor greatly. 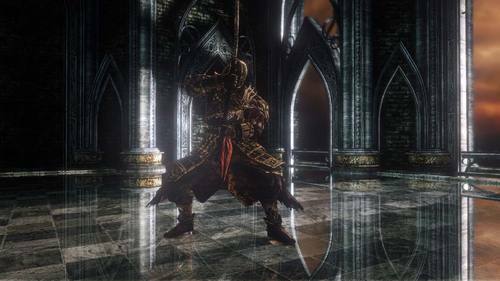 He will bow to the Player before they fight, and if defeated by the Player without taking damage, Sir Alonne will perform Seppuku (ritual suicide). It is likely that by killing Sir Alonne, we set into motion the events that would eventually end the Old Iron King’s reign. The Undead Curse was spreading throughout his Kingdom and he was in desperate need of guidance, yet his most trusted knight had just departed. The Old Iron King may have turned to his loyal pyromancer; Eygil. Together they may have created the Smelter Demon, perhaps to replace Sir Alonne by his side. But the Demon turned on the Old Iron King and cut him down. His body sunk belong and met the one whose name must not be repeated, becoming ichorous earth. His body began to breed lava and eventually it subsumed the Iron Keep.